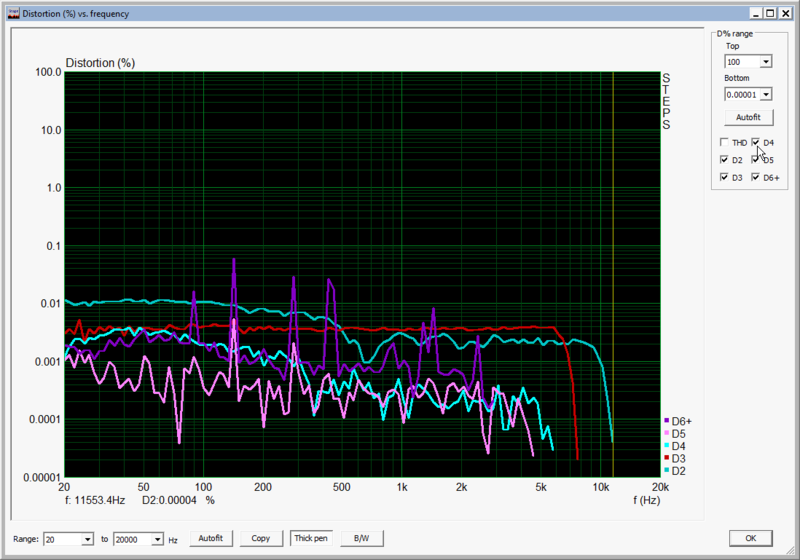 Today I did some measurement on the HifiBerry USB. The first measurement was the frequency response. Some interesting things happened. For this basic test I used ARTA. Input and output of the card were directly connected. Therefore the results of these measurements represent the input and the output stage together. If there are any influence between both (e.g. crosstalk), this will have an impact on the measurements. Much better! The roll-off starts at 19kHz, -3db is above 20kHz. No glitches anymore. What happened here? I guess, that the chip is resampling everything to 44.1kHz. I will contact Texas instruments to find out more about this behavior. This entry was posted in Finished and tagged hifiberry, measurements, sound card on October 10, 2013 by Daniel. After getting I2S sound output running on the Raspberry Pi, I started communications with an ADAU1701. The chip has no sample rate converter (ASRC) integrated, therefore I had to configure the Raspberry Pi to output 48kHz I2S with BCLK=64*FS. I used the TDA1541A module, because it did exactly what I was looking for – at least at 44.1kHz. 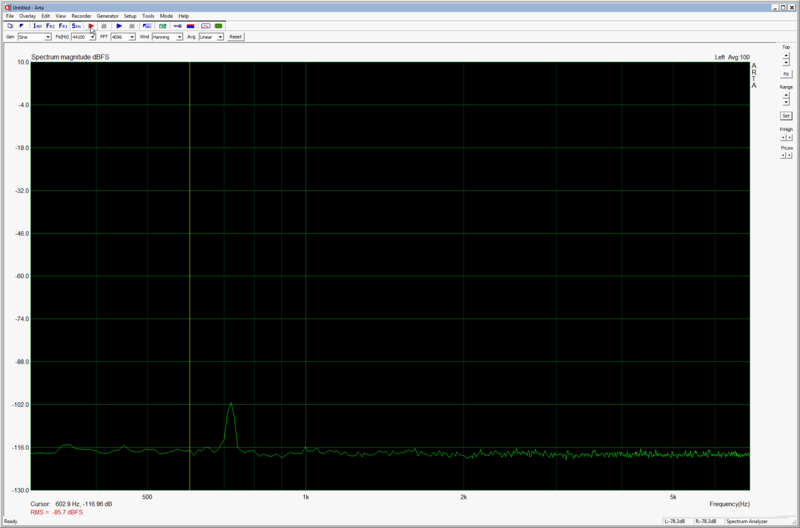 However, when I switched to 48kHz, the I2S output changed. What happend? 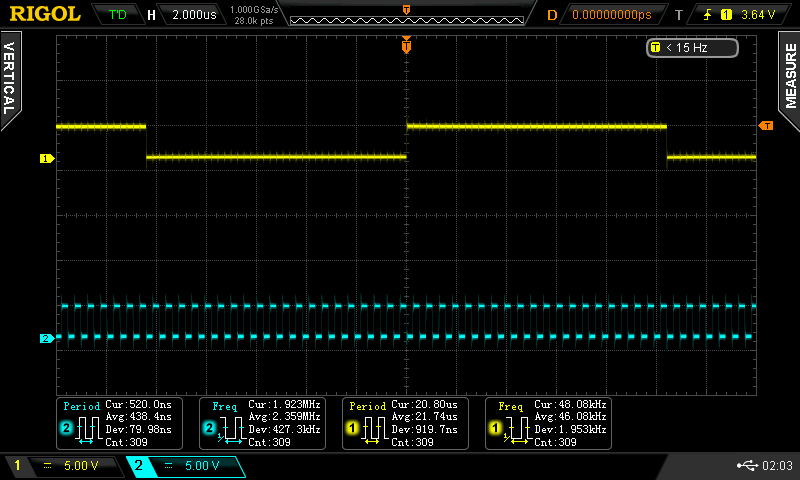 At 48kHz, the I2S bit clock was only 32*FS, not 64*FS anymore. It looks like a feature of the driver. This needs further investigations. 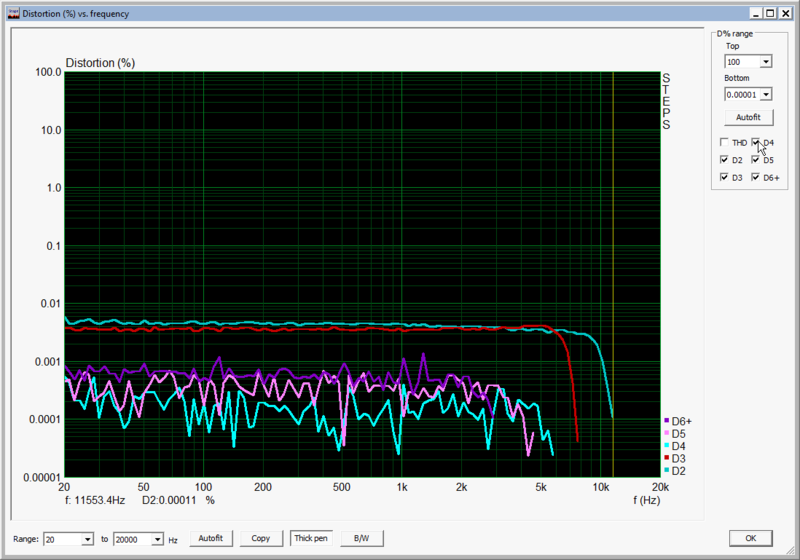 I might have to create a special driver, that only enables 48kHz with BCLK=64*FS. Unfortunately the ADC produces only noise. I have to investigate if there is a problem with the I2S data stream or if the signal quality is to poor to interpret the data correctly. This entry was posted in Projects and tagged clock, diy, driver, i2s, measurements, oscilloscope, raspberry pi on September 13, 2013 by Daniel. 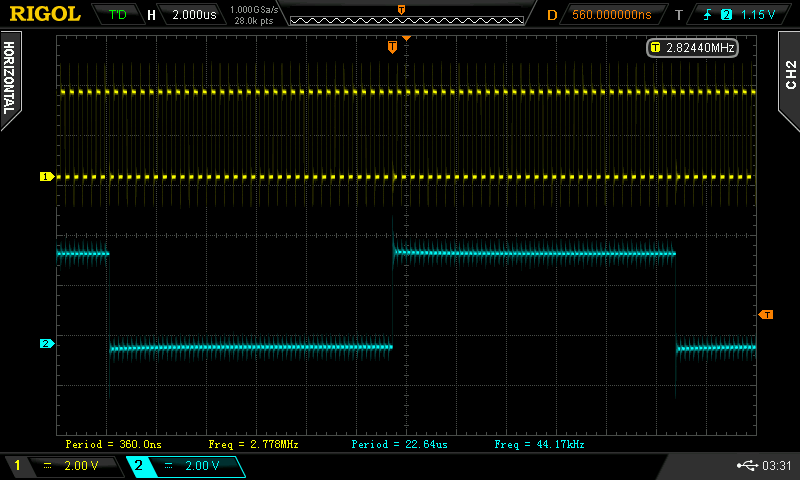 After some work and helpful web resources, one of our Raspberry Pi’s is now generating I2S signals. You can see, that this is a 44.1kHz playback, the LRCLK frequency is 44.17kHz, the bit clock frequency is 2.778MHz which is about 64x LRCLK (almost, the frequency counter on the oscilloscope is not extremely accurate). 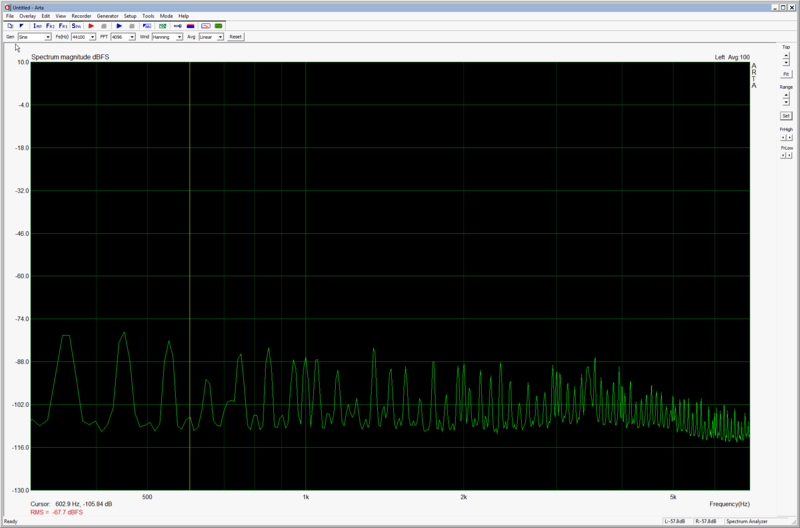 Having a look at the signal curves, you can see that there is a lot of noise and ringing on the signals. However, this is no problem, the voltages are never in the forbidden area. Another interesting question is: How much jitter do we see on both clock signals? 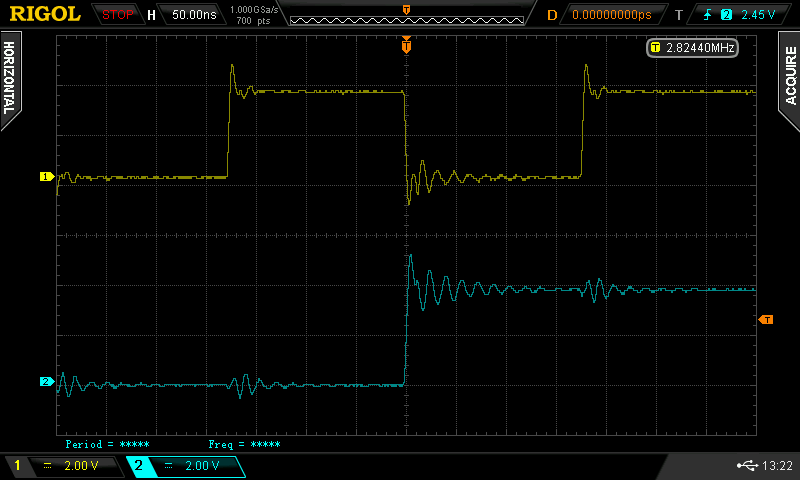 Using the statistics functions on the oscilloscope (which are not the best method to measure jitter) we see a jitter on the clock signal of about 800 ps. On the lower frequency LRCLK, the jitter can’t be measured with my oscilloscope anymore. It is too low – which is a good sign for a high quality sound reproduction. Many thanks to Koalo and Noise if good for the helpful guide to compile a new kernel with I2S support. Are you looking for a Raspberry Pi I2S sound interface? Check out our HiFiBerry Mini! This entry was posted in Projects and tagged electronics, i2s, jitter, linux, measurements, oscilloscope, raspberry pi on September 12, 2013 by Daniel.